While not as publicized as cases of police brutality and police shootings in cities like New York, Oakland, Ferguson, and Baltimore, the 2014 killing of Dontre Hamilton in Milwaukee is as shocking and tragic as any. In broad daylight in the middle of downtown, an officer responding to a complaint from a Starbucks employee approached Dontre Hamilton, an unarmed black man coping with paranoid schizophrenia resting in a public park. Minutes later, the officer shot Dontre 14 times. The absolutely riveting and often angering documentary The Blood Is at the Doorstep digs deep into this case and its aftermath, following Dontre’s family and surrounding community for three years. We get incredible access to Dontre’s mourning mother Maria and determined older brother Nate, both of whom become committed activists in the wake of Dontre’s killing. We also spend time with Milwaukee Police chief Ed Flynn, examining his response to Dontre’s case and the still-unfolding legacy of that response. 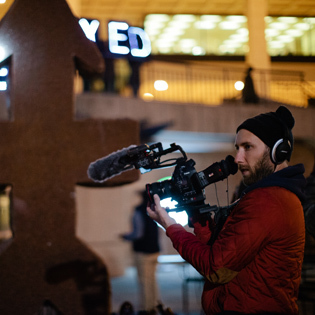 Erik Ljung is a freelance Producer and Director of Photography currently based in the midwest. He has produced content and short documentaries for the New York Times, VICE News, Al Jazeera, PBS and the Wall Street Journal. In 2016 he won a midwest Emmy for his work on public television's Wisconsin Foodie. His cinematography can be seen on CNN’s The 414’s, which premiered at Sundance, and Almost Sunrise slated to air on POV in 2017. He is a former Nohl Fellow, and a two-time Brico Forward Fund recipient for his documentary work.